Skyrocketing caseloads, mounds of paperwork, and unpredictable schedules are among the challenging, but common, obstacles that block social workers from their mission: protecting families. Most heartening to us at Northwoods is the impact it’s having on social workers’ and case aides’ morale and ability to fulfill their missions. Instead of spending up to 75 percent of their days on paperwork, workers are whittling down time spent on documentation to spend it on families. "I am most excited about being able to spend more time with the license holders, and just having that quick access to all those documents. I'm excited about being a lot more organized. 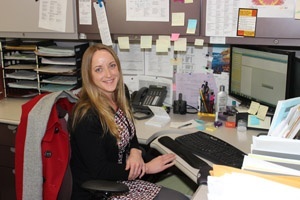 I'm excited about not having stacks of paper on my desk,” said Jenny Losinski, Case Aide. To learn more about Winona’s story, download the case study "Technology in social worker helping Winona County Community Services automate paperwork to focus on families." See more firsthand reactions from social workers, supervisors, and the director in this video case study. Winona County Community Services became the first social services agency in the country to start using Northwoods’ Compass® CoPilot® for iPad® to give workers in children and family services, adult mental health and chemical dependency technology in social work, creating a truly mobile social worker.